Near-Earth Asteroids | What are they? Where do they come from? 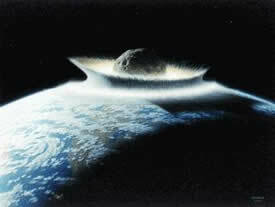 Artist's conception of an asteroid impact. NASA image. Ever since the Earth formed 4.5 billion years ago, it has been bombarded with rocks from space. Each year about 50,000 tons of asteroidal material enters the Earth's atmosphere. Most of it burns up high in the ionosphere due to friction with air. But a few rocks get through. Impacts in the ocean pass unnoticed, though the larger ones could produce tsunamis. Others strike land and leave craters. This has been going on since the dawn of time and is expected to continue long after the Sun boils away our oceans in about 5 billion years. Large space rocks are called asteroids, and small ones are called meteoroids. When they streak through the atmosphere they are termed meteors, or "shooting stars". If they reach the ground, they are called meteorites. 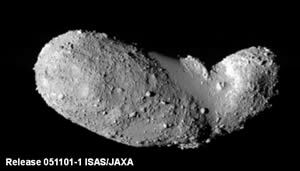 Asteroid Itokawa, visited by a Japanese Hayabusa spacecraft in 2005. It was discovered by the LINEAR asteroid survey team in 1998. Japan Aerospace Exploration Agency Image. Used with permission. The origin of comets and asteroids is not completely understood. Some asteroids are thought to be debris left over from the formation of the solar system. Others are believed to be fragments from a collision of large asteroids or protoplanets. Comets are known to be remnants of the early solar system but their numbers are very uncertain. Each year several dozen new comets are discovered. Most asteroids orbit the Sun in nearly circular paths lying between Mars and Jupiter. Comets originate in the outer fringes of the solar system, well beyond Pluto. They have extremely elongated elliptical orbits and each trip around the sun takes thousands or millions of years. In general, neither asteroids nor comets are a threat to Earth. This is because their orbits stay the same year in and year out, just as the Earth's does. Once an asteroid is identified and its orbit determined, its future path can be predicted very accurately. Most asteroids don't come anywhere near the Earth. But a few have been nudged from their originally circular orbits by a close encounter with Jupiter or a collision with other asteroids. Their new orbits – which are also predictable - bring them to the inner Solar System where they can threaten Earth. These are the so-called "Earth-crossing" asteroid families; Apollos, Amors, and Atens. Artist's Conception of the comet Shoemaker-Levy 9 fragments crashing into Jupiter in July 1994. NASA Image. Most asteroids and meteorites are composed of rocks similar to those on Earth – olivine, pyroxene, etc. These are called "chondrites", or "stones". Stones that are rich in carbon are called "carbonaceous chondrites" and some of these contain amino acids, the building blocks of life. Some astronomers believe that life on Earth was seeded by comets and meteorites. About 10% of meteorites are called irons. Irons are alloys of nickel and iron and dense metallic bodies. Most of the meteorites displayed in museums are irons because they are tough enough to survive our atmosphere. Irons are also easier to identify on the ground because chondrites often resemble ordinary rocks. Meteor Crater in Arizona was caused by an iron. Comets are much less common than asteroids, but once in a while they strike the Earth too. Comets are irregular balls of dusty ice - "dirty snowballs" - a few km across. They are largely inert except when they are heated as they pass near the sun and release gas and dust to form their tails. The object that struck Siberia in 1908 is thought to have been a comet. An estimated 10-20 megaton air blast devastated more than 2000 sq km of forests near Tunguska. No fragments were found leading to the belief that it was a comet, its ice having evaporated. In 1994, comet Shoemaker-Levy 9 smashed into Jupiter, a sober reminder that cosmic collisions are still happening. How Often Do They Hit The Earth? Every day! But only rarely does one reach the ground. Depending on their composition, meteors smaller than about 10 m in diameter do not survive their passage through the atmosphere. A smaller iron would probably make it through but it would take a larger comet to survive our atmosphere. The table below shows the approximate frequency and energy of the asteroids, along with estimates of the human death toll for various size asteroids. The larger the asteroid, the rarer it is. Graph showing the relationship between the size of an earth-impact asteroid and the frequency of such an event. The amount of impact damage and its extent depends on the kinetic energy of the asteroid. Those moving faster carry more energy than those moving slower, and more massive ones have more energy than smaller ones. While it is possible for a BB to have the same energy as a cannon ball, the BB would have to be traveling one hundred times faster. Impact energy is measured in terms of metric tons of TNT. The atomic bomb dropped on Hiroshima was about 15 kilotons. Meteors come in so fast that they form craters in a slightly surprising way. At up to 72 km/sec, they burrow into the ground and form a narrow tunnel by compressing and vaporizing themselves and rock along their path. This forms a hot bubble of gas. The pressure from this gas explosively expands and throws material upward and outward. What remains is a shallow, circular crater. Much of the debris falls nearby and forms an elevated ejecta blanket. Except for the slowest moving asteroid, it doesn't matter what angle the meteor comes in at. The underground explosion produces the crater, not the initial penetration. It also doesn't matter what size the particle is, as spherical microcraters on NASA's LDEF spacecraft revealed. Objects 1-2 km in diameter represent a critical threshold for global catastrophe. Above these sizes, material thrown into the atmosphere encircles the globe and reduces sunlight and plant growth. Even larger asteroids will cause hot material to rain down all over the earth. This will start fires and the smoke will further block sunlight. Such changes cause global cooling and loss of plants which results in mass starvation and extinction of large land animals. Impacts in the ocean can create tsunamis that will devastate coastal areas. Sea life in the vicinity of the impact area will be annihilated. Fortunately, impacts by such asteroids are extremely rare. There are less than 200 known impact craters on Earth. But the Moon has millions of them. Why don't we have more? The first reason is weather. Wind and rain, freezing and thawing, and heating and cooling erodes rocks, breaking them into tiny pieces. Plants grow and cover exposed rocks and also break them down. If we could see through forests and jungles, aerial pictures would surely show more craters. But plate tectonics is even more important than erosion. As the continents move and scrape against each other, rocks are folded, lifted, buried and shattered. Every 200 million years or so, 75% of the Earth's surface is created and destroyed, mostly in the oceans. Continents float above the sea floor but they too are subject to enormous reshaping. Erosion and tectonic forces eventually obliterate every geologic structure on the surface of the Earth: mountains, rivers, deserts, sea shores - and impact craters. This is why most craters that we know of are relatively young. Learn More: Earth-Crossing Asteroids: How can we detect, measure and deflect them?